We supply wide range of Environment Systems as standalone systems as well as Integrated Management Systems. One single device to measure and record Temperature, Humidity, Light and Air Flow Velocity and Sound and data can be recorded on to a SD card. The recorded data can be transferred to Microsoft Excel. Also External sensors for various applications also can be connected. The battery laps a minimum of 40 hours and maximum of 120 hours depending on the data sampling rate, environment conditions etc. This is a unique portable X-band weather radar with large functionality integrated in small device sold for favorable price. 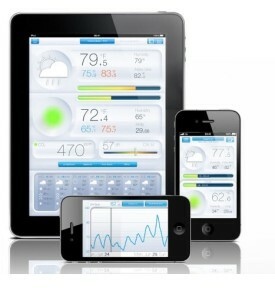 It provides real time insight to weather situation up to 100 km range. Weather and Air Quality monitoring, indoor and outdoor.Measure CO2 concentration and monitor confinement.These are wireless sensorsGet local Air Quality Index report, real-time.Improve your indoor wellnessYou can install the App on any and all of your devices.All of your data is stored online and permanently accessible from the App or the WebApp. The data is collected and transmitted through GPRS data transmission using a SIM card. The unit collects the data and converts into data packets to be transmitted through GPRS mode. The data will be available on a cloud based server and can be viewed over the internet. Alternately the data can be transferred to a centralized server and be downloaded by any computers within the network. This weather station can also be combined with Solar cells so that this can work on solar power. Vacker Arabia is a major supplier of all items related to environment monitoring across the entire Kingdom of Saudi Arabia covering Jeddah, Dammam, Riyadh, Jubail and Khobar.